Texture: the quality of a surface. In image it leads to belief in its 'feel'. 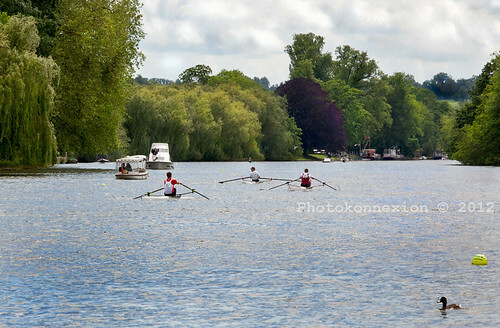 Regatta - the River Thames at Marlow, Buckinghamshire, UK. The layering, dark ans shade in the trees in this image give the picture a feeling of realistic depth. It is almost as if you could reach out and touch the trees to feel their texture. The representation of the structure and minute moulding of a surface (esp. of the skin), as distinct from its colour. OED online version : Second ed., 1989; accessed 15 June 2012 . Woven cloth, to the touch, feels slightly upstanding, a little rough and of a regular, repeating pattern. This ‘feel’ would guide our use of the term texture. In a picture we cannot feel the fine upstanding grain of things with our fingers. However, we can see the variations in pattern, shape and form which are defined by the colours, light and shadows. Indeed, in some photographs the variation in the light and the dark are so convincing that we can almost ‘feel’ the texture although it is not there. It is this three dimensional ‘feel’ that convinces us there is a ‘texture’ on the page. When we refer to it in an image we suggest the eye is fooled into believing that the depth, roughness and pattern in the image is real. In a photo you can not feel texture, but you can think of how it ‘might’ feel if you had experienced it before. Thus, in a photo, it might be referred to as creating a meta-experience in the mind that recreates the actual feel. Texture is one of the Elements of Art. It is also fundamental to the understanding of an image by the viewer.